Andre arrived in Haiti on Tuesday, March 9 at noon. His brothers Reginald and Johnny were there to pick him up, along with his five 50-pound bags, 40-pound carry-on and day pack. We were really lucky to get all that on the flight because American Airlines tightened their baggage restrictions on all flights to Haiti. Normally, on international flights they allow two 50-pound bags for free, plus up to three more for $100 each. At the last minute we found out we could only take one extra for $100. We already had them all packed, so we decided to get to the airport three hours early and act like we didn't know about the change. Our plan worked. Upon arrival in Port-au-Prince, Andre was upset to see that his bags had been opened, especially the two relief tents which we had wrapped so carefully and sealed with packing tape, mummy-style. He had to pay off the customs officers with shampoos, soap, toothbrushes and toothpaste. But the rest got through: two 14-foot dome tents, two smaller tents, three air mattresses and foot pump, three 16' x 20' tarps for the floors of the dome tents, flashlights, hand tools, soccer balls and cleats, some clothes, jump ropes, nuts, canned tuna, packaged foods, more toiletries, medications, band-aids...plus even more stuff I can't remember now. Before Andre left, I called our cell phone companies. 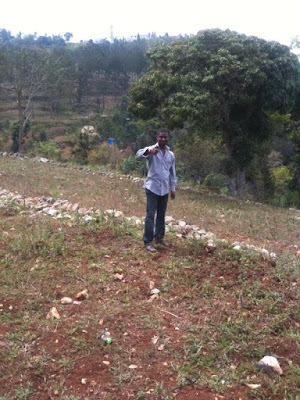 Verizon has no service in Haiti. My iPhone with AT&T service would work, plus they have a special plan because of the relief workers. For $20 per month pro-rated, we have an international plan for Haiti and the Dominican Republic: phone calls anywhere in the world for 25 cents a minute (instead of $1.99), data (internet and email) for 50 cents a MB instead of $20, and text messages for 10 cents each. They couldn't tell me exactly how many emails you get for one MB of data, but it's roughly 300. About half that many if there are attachments. So he took my iPhone and I have his Verizon phone. Andre's been busy since he arrived. He handed out the stuff he brought. The finger flashlights that someone from Minorsan donated were a big hit. 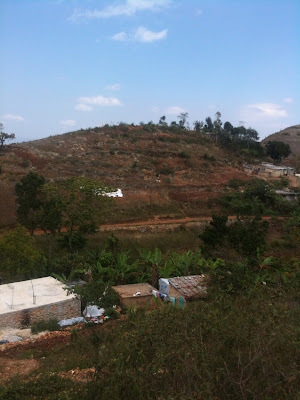 He also went up to the village of Athis with his stepfather and brother. They're ready to buy the land, but the escrow office is destroyed. 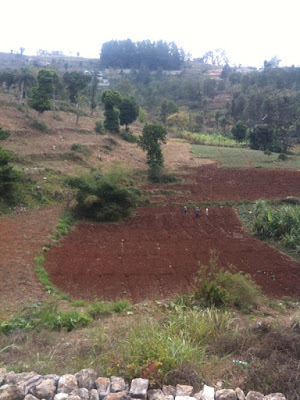 So he got a meeting with the seller on Friday to talk about making a deposit on the land through a lawyer, to guarantee the price, and hopefully to allow them to start building. 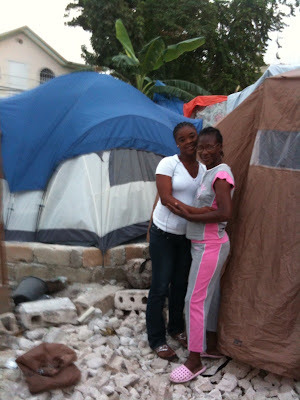 Andre also sent me photos of his friend "Coach", his Aunt Miche and sister Beatrice in front of the tent that a friend donated. This friend's sister works for Eureka Tents, so she was able to get a returned tent for $20, regularly $150 new. Miche is sharing it with four others. Andre's family hasn't been able to put up the dome tent because there's no space for it. They're staying in a campsite with about 70 families not too far from their house. They can't go anywhere else because they wouldn't be able to keep an eye on their house and their possessions. Another dome tent went to a friend's family and they've been able to set it up. Andre didn't send me any pictures of that yet. He did send me pictures of the Hotel Villa Imperial where we used to pay $5 a day to go swimming, use their wi-fi, and recharge cell phones and my laptop. 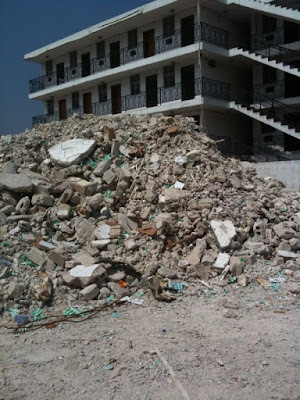 The owner of the hotel died in the earthquake. I was glad to hear that the manager survived. Fortunately, he was out in the parking lot when the earthquake hit. 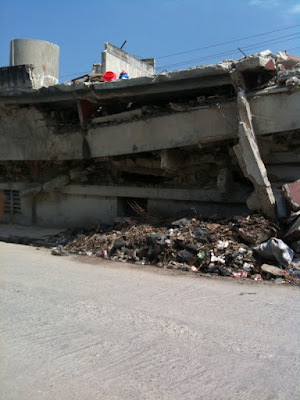 Andre sent another picture of a destroyed building just a few blocks from his folks' house. Andre thinks his family's house might be repairable. That would be the best short term solution to get them safe from the rainy season that's coming up soon. I asked him to see if he can find a seismic engineer to inspect it -- preferably from California or another place that gets earthquakes frequently. I'm leaving on Tuesday, changing planes in Miami and Santo Domingo. I have an overnight layover in Santo Domingo. I was joking that I should set up the dome tent and air mattress for myself in the airport. My own little refugee camp. 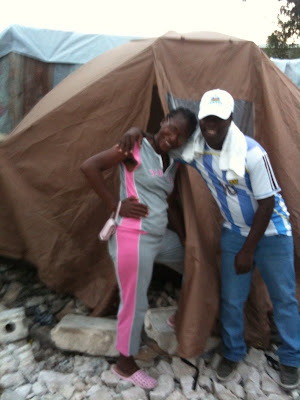 Andre and I are booked on the same return flight on April 7, overnighting in Miami with some Haitian friends.